I have been training dogs for over 12 years. 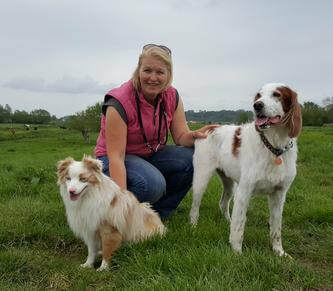 I live with my husband Jon and 3 dogs; Morgan is a Red and White Setter, Cuba a Miniature American Shepherd and Bria a Border collie. Morgan has taught me valuable lessons about training gun dogs and how their noses can get them into trouble! Cuba and I compete in agility and we also love doing trick training, nose work and Hoopers. Bria I have recently taken on at 9 months as an unwanted farm dog and we are just starting to work on some basic training and building a relationship. I have qualified as a Clinical Animal Behaviourist by completing a Masters (MSc) in Applied Animal Behaviour and Welfare at Newcastle University in 2017. ​I started my animal education with a diploma in animal behaviour with COAPE in 2000 (Centre of Applied Pet Ethology). This gave me a fantastic theoretical knowledge of animal behaviour so I then needed to get some hands on experience. Training with Scallywags School for Dogs provided me with this. Starting as a class room assistant and progressing on to take my own classes and behavioural cases. I have also worked with The Blue Cross re-homing centre, working with their rescue dogs looking for new homes. I became a full member of the APDT (Association of Pet Dog Trainers) in 2007 because I believe that dog trainers should work to a code of practice and only use ‘Kind, Fair and Effective’ training. I had to pass a written exam, was assessed carrying out a training class, and have been interviewed by a panel of assessors before being accepted as a full member. I do not use any invasive, coercive or punitive equipment or methods. Training must be fun for the dog and owner. Building a good, positive relationship is the most effective way you can have a happy and contented dog. ​The field of dog training is continuing to develop and change and I make sure I am up to date by attending courses and conferences as often as I can. I live with three dogs, Poppy, Fly and Finn, and a cat, Treacle. I got Poppy as a puppy, we competed in agility when she was younger, and now she has fun using her nose for scentwork. Fly came to me as a very scared and reactive 7 month old. We’ve worked hard and overcome most of her issues, but she remains a little wary of other dogs. Finn is my youngest, he has sadly retired from agility with health problems so we’re now having fun with hoopers, scentwork and rally obedience. My experience with him has led to me learning more about different activities and I’m now a Level One Scentwork UK trainer, and an Accredited Canine Hoopers UK instructor. I worked at National Animal Welfare Trust for 4 years which gave me a good insight into some of the issues that rescue dogs and their new owners can face when they’re re-homed. I am now a Clinical Canine Massage Therapist (www.somersetcaninemassage.co.uk) and proud member of the Canine Massage Guild. Do have a chat if you have any concerns about your dogs health. I have always had a love of animals and now that I am retired I can now spend more time working with them. 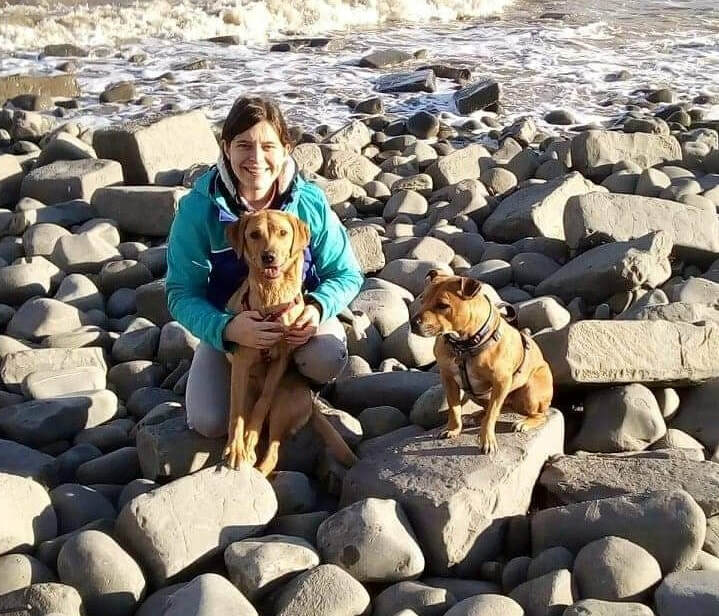 I assist with the Cheddon Fitzpaine training classes and I am aiming to become a member of the Association of Pet Dog Trainers when I have gained enough knowledge and experience. My name is Annie. I completed my BSc Hons in applied animal management in 2012 before working in a veterinary practice for four years. I've always loved dogs, and have a keen interest in dog behaviour and training. I help with the evening classes at North Newton, and Dog Club and Reactive Group at the weekends. I live with my husband, four cats, and two dogs. Bruce is a rescue staffy, who despite some anxiety with strangers and other dogs, is full of enthusiasm and a pleasure to own. He loves to learn new tricks, and we enjoy doing canicross together. Ember is a labrador puppy, when she's older I hope to work with her doing canicross. I also hope to use her as a stooge dog when working with reactive dogs, so we're working hard to bombproof her at the moment. I have been helping with the classes since 2017, and have gained a lot of experience in this time. I aim to be more involved in leading the sessions, this will help prepare me for becoming a member of the APDT, which is what I'm currently working towards.